Injection lipolysis is an effective nonsurgical option for body contouring. Proper patient selection and technique form the basis for successful results. Patients need to be explained that the results are going to be subtle and not as dramatic as that after surgical body contouring. We believe this technique though a nonsurgical one should be present in the armamentarium of all plastic surgeons, dermatologists, and cosmetologists trained in invasive as well as noninvasive body-contouring procedures. A shapely body is everyone’s desire. The World Health Organization (WHO) has reported obesity as a common, underestimated, and neglected public health problem in both developed and developing nations across the globe. According to the WHO World Health Statistics Report 2012, one in every sixth adult is obese globally. Being overweight is a precursor to being obese. Removal of subcutaneous fat by liposuction/injection lipolysis is a body-shaping procedure that targets localized areas of fat, which is not amenable to exercise and diet. Liposuction to remove subcutaneous fat is the most common cosmetic surgery procedure. However, liposuction is a surgical procedure and is expensive, often needs general anesthesia, and has a theoretical risk of life-threatening complications. Nonsurgical alternatives to liposuction in common practice are cryolipolysis, radiofrequency ablation, HIFU (high-intensity focused ultrasound), and injection lipolysis. The use of lipolytic drug to induce a nonsurgical fat reduction is a common method in cosmetic medicine, and has been used as surface application (creams, gels, and lotions) or through local injections,,, especially for clients seeking nonsurgical alternatives for the areas that may not be amenable to conventional liposuction. Recent approval of deoxycholate (DC) for the purpose of injection lipolysis by the US Food and Drug Administration (USFDA) has made injection lipolysis as one of the mainstream nonsurgical techniques for body contouring. Dissolution of subcutaneous fat by injections of lipolytic agents has been in vogue in the European and South American countries since the last five decades. Of late, DC preparation Kybella (Allergan USA, Inc., Irvine, CA 92612) has received the USFDA approval for contouring the submental region. Several studies have reported the efficacy of phosphatidylcholine (PC), DC, as well as their combination together with other additives such as l-carnitine, vitamin E, collagenase, hyaluronidase, and isoproterenol. All studies have reported encouraging results in the Caucasian population. We have been using a cocktail of PC and DC since 2004 and have found it to be equally effective in the Indian and Southeast Asian clients as well. First reported use of this particular class of drugs was for the dissolution of atheromatous plaques in systemic arteries and was followed by further usage in the dissolution of pulmonary fat embolism. However, the dosage used in such applications was relatively much higher as compared to the ones we use in aesthetic procedures. Maggiori used PC for infiltration into xanthelasmas and a Brazilian dermatologist self-experimented local injections of PC for lower eye bags. However, due to safety concerns the usage in periocular areas is no longer recommended. Further studies on the subject started in Europe in 2001, and “Network Lipolysis” was founded in Germany in 2003 to extensively study the scientific basis of injection lipolysis. Since then PC and DC have been used off-label across the world for injection lipolysis. Rotunda et al. postulated that the usage of PC solubilized in DC produced better results with lesser side effects. Biochemically sodium DC is a bile salt and PC is a glycerophospholipid. Biochemical nature of PC is that of a glycerophospholipid. Sodium DC is a commonly used detergent and is used to solubilize PC. The resultant cocktail has synergistic action and shows lipolytic action when injected into subcutaneous fat.,Compounded PC preparations are now being commonly marketed as minimally invasive alternatives to liposuction or as post-liposuction “touch-up” procedures.,We have been using PC solubilized in DC in our practice since 2004. We hereby present our methodology and results. A total of 1269 patients have been treated since 2004 using PC–DC combination for lipolysis. The age group varied from 18 to 55 years of age. The male to female ratio was 245:1024. The different target areas that were subjected to treatment included face (malar and jawline areas), submental, upper arms, abdomen, back (bra rolls), flanks, thighs, knee region, and calves. Of 1269 cases, 157 were touch-ups after liposuction and 1112 were of primary injection lipolysis. Inclusion criteria for the study included clients who primarily wanted a nonsurgical option for inch loss in primary as well as secondary (touch-up) settings. Exclusion criteria included reported allergy to egg and/or soybean, local infections or skin problems, ongoing anticoagulant medications, patients who were immunocompromised, patients with hormonal imbalances (hypothyroid and polycystic overian syndrome), and pregnancy and lactation. Patients with unrealistic expectations form an important relative contraindication for the procedure. After thorough clinical examination and metric documentation of areas to be treated, patients were photographed and a record of treatment outcomes as well as side effects was maintained. A similar protocol was followed for each treatment session. The PC/sodium DC combination (Dermastabilon) manufactured by Skin Tech Pharma Group, Spain, was used. This 5-mL preparation has 250mg of PC and 100mg of DC. We carried out the procedures under sedation as topical preparations do not achieve desired analgesia at the depths at which the chemicals act. Also the injection of local anesthesia solution would alter the topography and hamper the clinical judgment. For patients who claimed to have a better pain tolerance and who were unwilling for sedation, we used cooling wands and vibrators during the procedure. 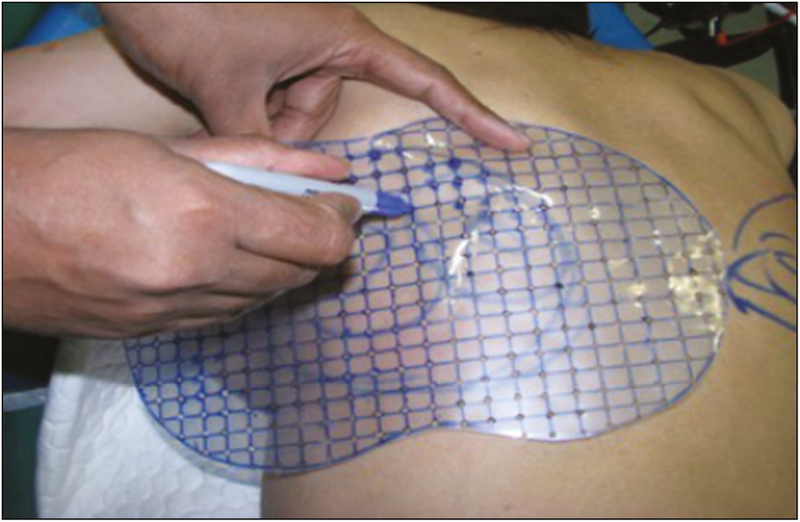 The injection sites were guided by a custom-made predesigned grid [Figure 1], which ensured the injections were adequately spaced and the projected cone of lipolysis had a minimal overlap ensuring a smoother transition into the zone of neighboring injection. The amount injected per site was about 50% less on the face compared to that on any other body part, and the amount injected at each injection point was no more than 0.3cm3. The maximum dose in one sitting used was 5g. The depth of injections was 10mm in body and 5mm in face. We followed the minimum interval of 4 weeks between two subsequent sittings. The maximal appreciable effect was achieved in 80% of patients by day 10; however, the drug continued to act for 6–8 weeks. All patients were asked about their degree of satisfaction about the results of their treatment and whether they were very satisfied, satisfied, fairly satisfied, or not satisfied. Treatment satisfaction was assessed with visual analog scale (VAS) score from 1 to 10. Clinical photography is a must in this scenario as results are subtle and patients better appreciate the pre- and post-op difference in the pictures clicked rather than in a mirror. The final measurements and photographs were taken 8 weeks after the last session. The effects are best appreciated over the face (malar, mandibular, and submental areas) [Figure 2], [Figure 3] and [Figure 6] and arms, whereas back arms [Figure 7] and knee areas [Figure 8] show average results. Young females appreciated the results in bra roll area [Figure 4] better than that in the flanks. The results are better appreciated in primary lipolysis. The need for follow-up sessions (1–2 sessions) of lipolysis and the quantification of results in subsequent sessions reveals that maximal improvement is achieved in the first session. Stinging sensation was present in almost all patients for first few hours and was relieved by the end of day in majority of them. Localized swellings also were reported in the treated areas for 24–48h and were well controlled with pressure garments. Many patients, particularly the fair-skinned ones, complained of erythema for a day or two following the injections. Also commonly observed complaints were cholinergic symptoms such as diarrhea and malaise and were always observed in the first 24h after treatment particularly when total dose injected exceeded 3g. Other complaints such as formation of subcutaneous nodules resolved over a period of time. 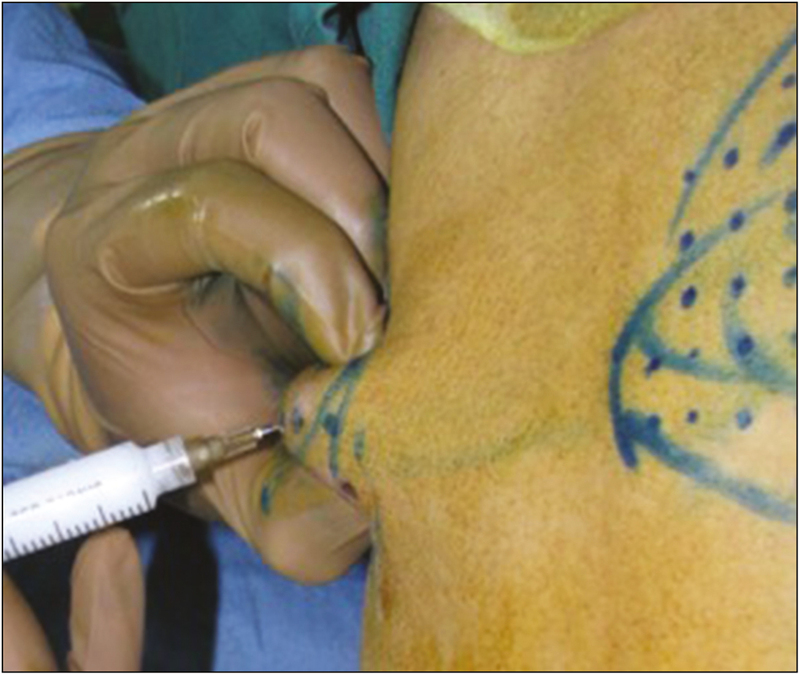 Accidental injection into the muscle causes excruciating pain because of myonecrosis, and hence we recommend pinch technique for injections as shown in [Figure 5]. Majority of the patients underwent treatment at more than one body region and it was our observation that the patients who showed good results in one region were more likely to be satisfied with treatment in other regions as well. We have summarized our results in [Table 1]. The most common technique for body contouring has been liposuction. Of late, many noninvasive methods of body-contouring treatment have been reported world over and many case reports have been published. The fact that liposuction as well as injection lipolysis both are body-contouring procedures and are not a treatment for obesity per se must be understood. Also liposuction is a onetime surgical procedure, whereas injection lipolysis is a nonsurgical procedure and needs multiple sittings along with a longer lag phase for final result to be apparent. It is to be noted that injection lipolysis is not same as mesotherapy as is the common misconception. Mesotherapy involves intradermal injections, whereas in injection lipolysis, the drugs are delivered in the subcutaneous tissues. Accordingly, we have incorporated injection lipolysis in our practice since 2004. Over the years, we have been having reproducible results and our patients have been satisfied with the results. This is evident by the fact that many patients reported back to us for correction of other areas and preferred to have injection sessions before considering liposuction. On the contrary, patients who have earlier undergone liposuction for some other areas in their body complained about the less dramatic and delayed effect achieved by this nonsurgical modality. We have been using injection lipolysis both as a single modality as well as a component of multimodality approach for facial contouring. PC is a glycerophospholipid and is artificially sourced from soybean lecithin. Biochemically, PC is the most important membrane lipid. The mechanism of action of PC in lysis of subcutaneous fat is still a matter of research. It has been postulated that PC stimulates the lipases and splits the triglycerides into fatty acids and glycerol. The fatty acids are metabolized by liver, whereas glycerol is water soluble. A number of studies mention PC acting as a chemical substance making lipids water soluble. It thereby stimulates lipases causing triglycerides to break into fatty acids and glycerol. Sodium DC is a bile salt that is also used as a laboratory detergent and is used to solubilize PC. The mechanism of action of DC seems to induce fat cell destruction in a nonspecific manner because of its detergent action. Both PC and DC have been independently used for injection lipolysis. The compounded preparation containing both has a synergistic action, and it has been scientifically evaluated and documented that when injected in fat layer, it causes vacuolization of adipocytes leading to their destruction, which are then cleared off by phagocytosis. Ideal cases for injection lipolysis are with small amounts of excess fat volume (up to 500mL). Results are encouraging if the nature of excess fat is easily compressible and of uniform texture. The use can be extrapolated to well-formed lipomas and post-liposuction deformities. However for solitary lipomas, surgical excision is best. Injection lipolysis has also been used for addressing residual fat packets after liposuction and post-fat grafting excess take. Our study had patients with similar indications. The majority of the patients were having small targeted areas of fat but were not in favor of surgery. A landmark paper by Franz Hasengschwandtner from Austria concluded that all patients treated with PC injections experienced a lipolysis effect. Similarly all our 1269 patients experienced lipolysis effect. We observed that when comparing successive sessions, no significant difference was appreciated after second session. Hence, if there was a significant improvement in the first session then there was always a lag phase wherein the reduction in measures was present but was not as dramatic for the patient to appreciate it visually. However, when we compared the initial session and final session results, the difference was appreciable. This finding was also observed by El Kamshoushy et al. Hence we concluded that all patients should receive multiple sessions as the results are cumulative in nature and are best appreciated at the end of treatment and not in between. Commonly encountered complaints after injection lipolysis were pain, edema, erythema, and a stinging sensation. However, these were temporary and typically weathered off within hours to 2–3 days after procedure. Severe pain was reported by 15 patients who inadvertently ended up with an intramuscular injection. This was controlled with a short burst of steroids (sliding dose), nonsteroidal anti-inflammatory drugs under oral antimicrobial cover and rest. With refinement in technique and use of pinch technique in later years, we did not come across this particular complication. 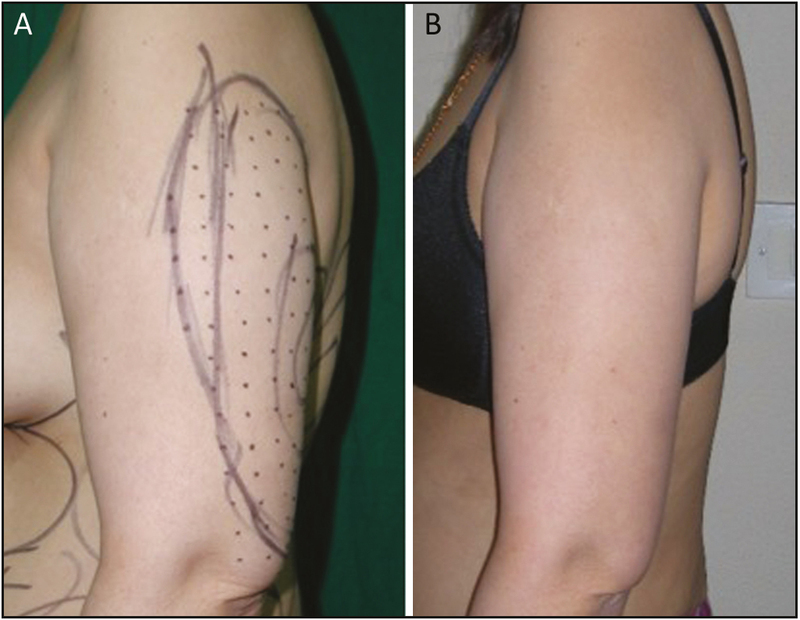 Subcutaneous nodularity was encountered in more than half of the cases. The scientific basis for subcutaneous nodules has been studied by Salles et al., and they postulated it to be a sequel of acute inflammation in which there was adipocytolysis, which healed with fibrosis and microscopic scarring. Patients need to be well informed about this particular side effect before the procedure and taken into confidence that it resolves over 3–4 weeks. We recommended massage and pressure garment therapy as an active measure to alleviate the nodule formation and to reduce its incidence. Clinical and ultrasonographic features of these nodules have been studied and it has been reported that PC and DC when used in combination resulted in fewer nodules, which are less painful and resolve faster than when either is used alone. Systemic side effects of injection lipolysis are encountered only when it is used in higher dosages as in patients undergoing treatment for multiple regions at a time. It has been reported that incidence of such effects is seen when the total dose exceeds 3g. The systemic side effects mostly constitute of parasympathetic reactions such as dull headache, nausea, diarrhea, and/or steatorrhea. These typically occur within the first 24h and resolve with symptomatic management in 2–3 days. Injection lipolysis being a day care procedure, we recommend to make all the patients aware of the possibility of these sequelae, more so if the total dose of PC is anticipated to go beyond 3g. There were eight cases in our patient sample that exhibited significant inflammation with the skin being red, inflamed, and swollen with the presence of localized hives. These cases settled over 2 weeks with antihistaminic, anti-inflammatory medication. In one case, we had to use sliding dose of steroids under antimicrobial cover. Hyperpigmentation was observed in our cases in certain areas, more so in the areas around the knee and inner thighs. It typically resolved by the end of third month. There have been reports of infections caused by atypical mycobacteria in literature., We fortunately did not encounter any such incidence probably because of our established protocol for sterility after having managed instances of atypical mycobacterial infections in cases of breast augmentation. Although liposuction is and is destined to remain the gold standard for reduction of subcutaneous fat, injection lipolysis has advantages of minimal downtime, less invasiveness, and most important patients’ psychology that no surgery is involved in the process. PC–DC is effective in reducing localized subcutaneous fat accumulations. We conclude that the results are additive and are best appreciated at the end of three sessions. Training and experience in the procedure is an essential prerequisite apart from proper patient selection for consistently good results. Injection lipolysis is a useful adjunct but cannot be considered as a replacement for surgical liposuction. The off label usage of phosphatidyl choline and deoxycholate had resulted in no standardisation of the dosage, techniques and treatment regimens. An official consensuas has been lacking on the same. Now with USFDA approval of Kybella we look forward to more systematic studies from centres across the world which will help in developing a standardised protocol for patient selection, drug choice, drug dosage, administration techniques and post procedural protocol and results assessment. Greenway FL, Bray GA, Heber D. Topical fat reduction. Obes Res 1995;3:561-8S. Greenway FL, Bray GA. Regional fat loss from the thigh in obese women after adrenergic modulation. Clin Ther 1987;9:663-9. Rotunda AM, Kolodney MS. Mesotherapy and phosphatidylcholine injections: historical clarification and review. Dermatol Surg 2006;32:465-80. The US Food and Drug Administration. Available from: https://www.accessdata.fda.gov/drugsatfda_docs/nda/2015/206333Orig1s000Approv.pdf. [Last accessed on November 30th 2018]. Reeds DN, Mohammed BS, Klein S, Boswell CB, Young VL. Metabolic and structural effects of phosphatidylcholine and deoxycholate injections on subcutaneous fat: a randomized, controlled trial. Aesthet Surg J 2013;33:400-8. Maggiori S. Treatment of xanthelasma with phosphatidylcholine. A paper presented at the 5th International Meeting of Mesotherapy, Paris, France, October 07–09, 1988. Rittes PG. 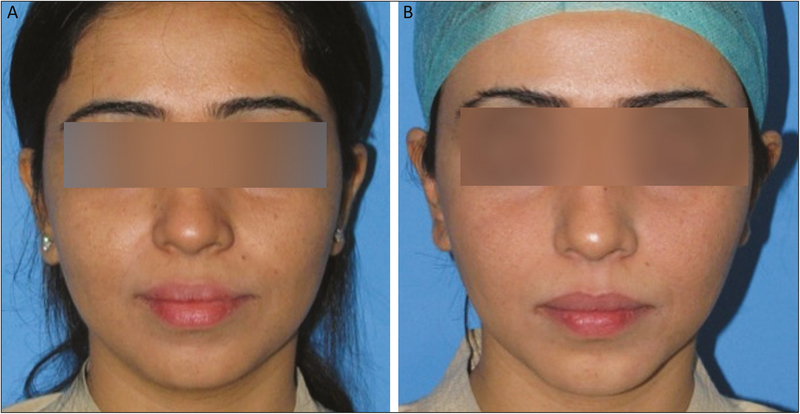 The use of phosphatidylcholine for correction of lower lid bulging due to prominent fat pads. Dermatol Surg 2001;27:391-2. Lichtenberg D, Zilberman Y, Greenzaid P, Zamir S. Structural and kinetic studies on the solubilization of lecithin by sodium deoxycholate. Biochemistry 1979;18:3517-25. Klein SM, Schreml S, Nerlich M, Prantl L. In vitro studies investigating the effect of subcutaneous phosphatidylcholine injections in the 3t3-l1 adipocyte model: lipolysis or lipid dissolution? Plast Reconstr Surg 2009;124:419-27. Hexsel D, Serra M, Mazzuco R, Dal’Forno T, Zechmeister D. Phosphatidylcholine in the treatment of localized fat. J Drugs Dermatol 2003;2:511-8. Thomas MK, D’Silva JA, Borole AJ. Injection lipolysis with a cocktail of phosphatidylcholine and deoxycholate: an Indian experience. Plast Reconstr Surg Glob Open 2016;4:e861. Duncan DI, Palmer M. Fat reduction using phosphatidylcholine/sodium deoxycholate injections: standard of practice. Aesthetic Plast Surg 2008;32:858-72. Hasengschwandtner F. Phosphatidylcholine treatment to induce lipolysis. J Cosmet Dermatol 2005;4:308-13. Thomas MK, D’Silva JA, Borole AJ. Facial sculpting: comprehensive approach for aesthetic correction of round face. Indian J Plast Surg 2012;45:122-7. El Kamshoushy A, Abel MR, El MN. Evaluation of the efficacy of injection lipolysis using phosphatidylcholine/deoxycholate versus deoxycholate alone in treatment of localized fat deposits. J Clin Exp Dermatol Res 2012;3:146. Hasengschwandtner F. Injection lipolysis for effective reduction of localized fat in place of minor surgical lipoplasty. Aesthet Surg J 2006;26:125-30. Salles AG, Valler CS, Ferreira MC. Histologic response to injected phosphatidylcholine in fat tissue: experimental study in a new rabbit model. Aesthetic Plast Surg 2006;30:479-84; discussion 485. Salti G, Ghersetich I, Tantussi F, Bovani B, Lotti T. Phosphatidylcholine and sodium deoxycholate in the treatment of localized fat: a double-blind, randomized study. Dermatol Surg 2008;34:60-6; discussion 66. Duncan DI, Chubaty R. Clinical safety data and standards of practice for injection lipolysis: a retrospective study. Aesthet Surg J 2006;26:575-85. Matarasso A, Pfiefer TM; Plastic Surgery Educational Foundation DATA Committee. Mesotherapy for body contouring. Plast Recon Surg 2005;115:1420-5. Nagore E, Ramos P, Botella-Estrada R, Ramos-Níguez JA, Sanmartín O, Castejón P. Cutaneous infection with Mycobacterium fortuitum after localized microinjections (mesotherapy) treated successfully with a triple drug regimen. Acta Derm Venereol 2001;81:291-3. Thomas M, D’Silva JA, Borole AJ, Chilgar RM. Periprosthetic atypical mycobacterial infection in breast implants: a new kid on the block! J Plast Reconstr Aesthet Surg 2013;66:e16-9.